The Messerschmitt BF-109 'Emil' was the Luftwaffe's premier single-engine fighter at the outbreak of WWII. This powerful Luftwaffe sighter ran wild over Poland, the Low Countries and France devastating its opponents. Throughout the war the Bf-109 constantly improved its aerodynamics, weapon systems and engines to keep up with Allied fighter development. Miniatures supplied in faction specific injected colour plastic. 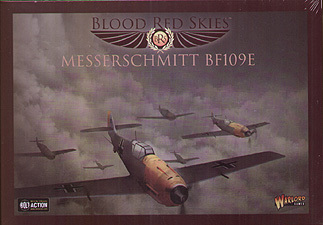 Requires Blood Red Skies air combat game to play.